Has written two novels with Peter Busby under the pen name of Peter Dunant. Sarah Dunant promotes Sacred Hearts. Sarah Dunant , Sacred Hearts. (Hardcover) to be Autographed after the Author Presentation. Please specify your need for One (1) Stamped Ticket and One (1) Guest Ticket (if needed) in the Notes field of your Online Order. If you choose Option 1 for In-Store Pick-Up, then you can specify At-Event Pick-Up in the Notes field of your Online Order. Thank you. Book Orders can be shipped worldwide. 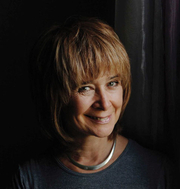 Author: Sarah Dunant is the International Bestselling Author of The Birth of Venus and In the Company of the Courtesan, which have received major acclaim on both sides of the Atlantic. Her earlier novels include three Hannah Wolfe crime thrillers, as well as Snowstorms in a Hot Climate, Transgressions, and Mapping the Edge, all three of which are available as Random House Softcovers. She has two daughters and lives in London, England and Florence, Italy. Title: Sacred Hearts, $25.00 Hardcover, ISBN 9781400063826, On Sale Date: July 14, 2009 What: Sarah Dunant will talk about her New Book, her life, her work, answer audience questions and she will autograph copies of her New Book purchased from Rainy Day Books, on our website and / or at our Author Event, that are accompanied by a Stamped Ticket. When: Monday, July 27, 2009, 1:00 PM Where: Round Trip Imports, 33071 W 83rd Street, DeSoto, Kansas 66018, Phone: 913-583-1511, www.RoundTripImports.com Round Trip Imports is the only direct importer of authentic Italian antiques in the Greater Kansas City Area and is your best source for authentic Italian antique furniture, chandeliers, sconces, doors, gates, architectural salvage, unique artwork, ceramics and much more. Every item is one-of-a-kind and hand-picked on buying trips to Italy. Sarah Dunant reads from Sacred Hearts. Paul Strathern promotes The Artist , The Philosopher and The Warrior. ; Sarah Dunant promotes In the Company of the Courtesan. Sarah Dunant, The Birth of Venus. Sarah Dunant's book Blood & Beauty was available from LibraryThing Early Reviewers. Sarah Dunant's book Sacred Hearts was available from LibraryThing Early Reviewers. Sarah Dunant is currently considered a "single author." If one or more works are by a distinct, homonymous authors, go ahead and split the author. Sarah Dunant is composed of 4 names. You can examine and separate out names.